When Cardinal Kim, the then Catholic archbishop of Seoul, met Brother Roger in Hong Kong in 1977, he asked for brothers from Taizé to come and live in Seoul, ‘to help the young people of Korea deepen their faith.’ The first brothers arrived in Korea in 1979 / 1980 and were later joined by others. Korea was the scene of a terrible, fratricidal war in 1950-53, which left deep wounds. Since then it has been divided into two countries with a completely sealed frontier between them. The churches, Catholic and Protestant, are extremely active in South Korea, with nearly 30 percent of the population calling themselves Christian. The brothers live in a small house in Seoul, only a few kilometers from the frontier with the North. Seeing their role to be above all a ‘hidden presence’ of prayer and service, a tiny sign of community, the brothers have developed a variety of activities according to their possibilities. The fraternity welcomes young people coming to pray with them in their home, and sometimes brothers lead prayers or retreats for parish groups. One brother is active in pastoral activities involving those in prison or terminally ill. Another, an artist, has designed stained-glass windows for a large number of newly built churches across the country. One teaches in a Catholic university and has translated many volumes of modern Korean poetry and fiction into English. 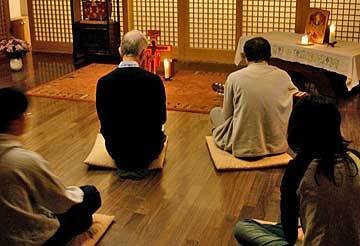 The Taizé songs have spread far and wide across Korea. From France, it has sometimes been possible to provide assistance for those suffering from hunger, poverty and disease in North Korea. 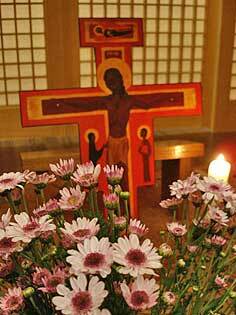 Many Koreans visit Taizé when they are travelling or staying in Europe. "Wherever you are, you carry within you one and the same calling. It is up to you always to be careful that your life reflects the vocation of our whole community."